This is a very basic guide to Pollen colours ... unfortunately your computer monitors might vary a little in reproducing the colours accurately. Also the phytocidal acids that bees add to the pollen-- to stop it geminating --probably (along with enzymes) alters the true colour of the pollens that are stored in the comb ... best to watch what the bees bring in at the front door. It is not an exhaustive list but a simple guide to give one an idea of what your worker bees are bringing back to the hive. The colours are shown from Spring thro Summer to Autumn. Just move your mouse pointer over the colours to see to which plant they belong. 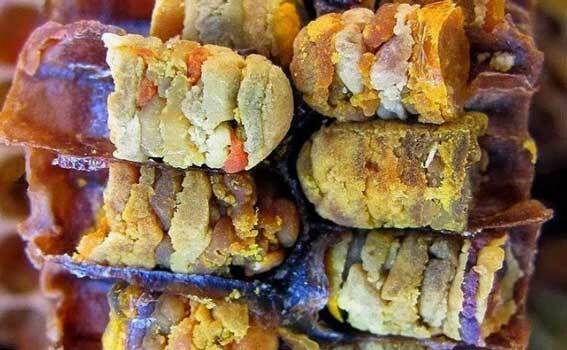 The photo shows various pollen bundles, packed by the bees into the cells of their comb. The pollen, mixed with some enzymes from the bees and a bit of nectar, will ferment into “bee bread”. Later, nurse bees will convert this into nourishment for the very young bees.